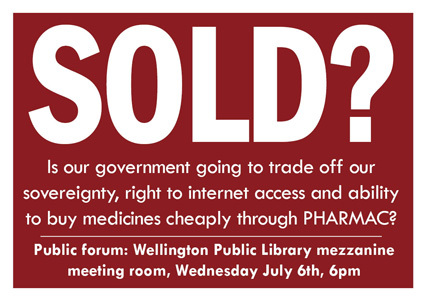 Tech Liberty spokesperson Thomas Beagle will be presenting at a public forum about the TPP free trade treaty in Wellington on July 6th. The forum is organised by local Wellington group, TPP Action. Are you concerned about more expensive medications through the loss of PHARMAC? Infringements on our civil liberties online? Loss of sovereignty? The Trans Pacific Partnership Agreement (TPP) is being negotiated in secret by the United States jointly with several Asian countries including New Zealand. Initially based on the North American Free Trade Agreement the USA will seek to extract long term binding agreement to limit the New Zealand government's ability to make laws and adopt policies designed, for example, to stretch Pharmac's ability to provide medicines, or to limit promotion of tobacco products. All to the benefit of global corporations. The text of the agreement must be released so its provisions can be openly debated. Des O'Day – lecturer in health economics in the Department of Public Health, University of Otago, Wellington. He has worked in the past for the Ministry of Health and Midland RHA. His areas of expertise include health services modelling, capitation and population funding formulae, and research into the links between income and health. All welcome. There will be tea, coffee and biscuits after the meeting. Any chance of recording/streaming the meeting? Good idea. Don’t think we can stream it, but I’ll look into recording and uploading it. If all government departments did as good a job as Pharmac, our taxes would be cut in half. Big drug companies hate Parmac because they quite rightly, fear that other countries will adopt the Pharmac model. Drug industry lobby groups are franticly wining and dining every politician on the planet, in a desperate bid to rid New Zealand of Pharmac. I fear that our government is so stupid that they will give Pharmac away in the pitiful belief that they will actually get something of value in return. What a shame you cannot stream it. Even though some people here managed to go to the Christchurch meeting, people in the rural areas ( I am in Timaru) are deprived of such forums and it is as important to us as the city dwellers. If recorded will it be available for public showing? Hi, we’re organising a video camera and will be uploading the footage somewhere online.